Robyns Simple Life: Father Neuhaus, R.I.P. It is with great sadness that I post today that Farther Richard John Neuhaus has passed away. For anyone who has ever watched EWTN, The World Over with Raymond Arroyo which is EWTN's weekly news cast and or any of the live events from Rome will certainly know who Father Neuhaus was. He would do a lot of the commentation for the live events from Rome so none of us missed a beat, or the USCCB here in the USA and was on The World Over Live with Raymond many many times. Father Neuhaus was a loyal son of the church, a dedicated priest and most of all a man of deep faith who loved our Lord Jesus with every ounce of his soul. For those of us who did not know him personally, we shared a connection with Father Neuhaus through television and print and he will be sorely missed and we pray, that Father is now in the arms of his redeemer and engulfed in His love and peace forever and ever. Amen. Here is an excerpt from official announcement. 'Fr. 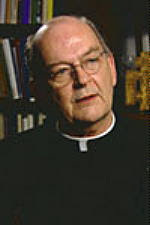 Richard John Neuhaus slipped away today, January 8, shortly before 10 o’clock, at the age of seventy-two. He never recovered from the weakness that sent him to the hospital the day after Christmas, caused by a series of side effects from the cancer he was suffering. He lost consciousness Tuesday evening after a collapse in his heart rate, and the next day, in the company of friends, he died.